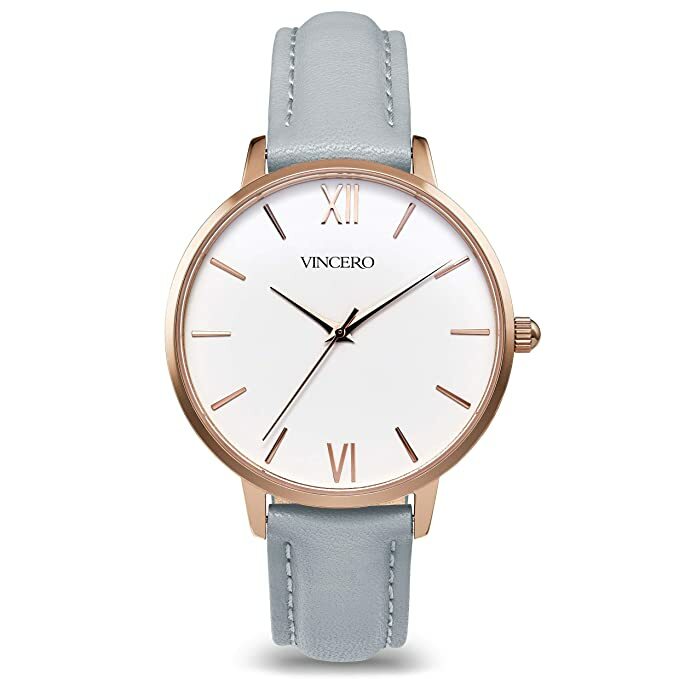 Vincero Watches is a brand that not many people are familiar with. 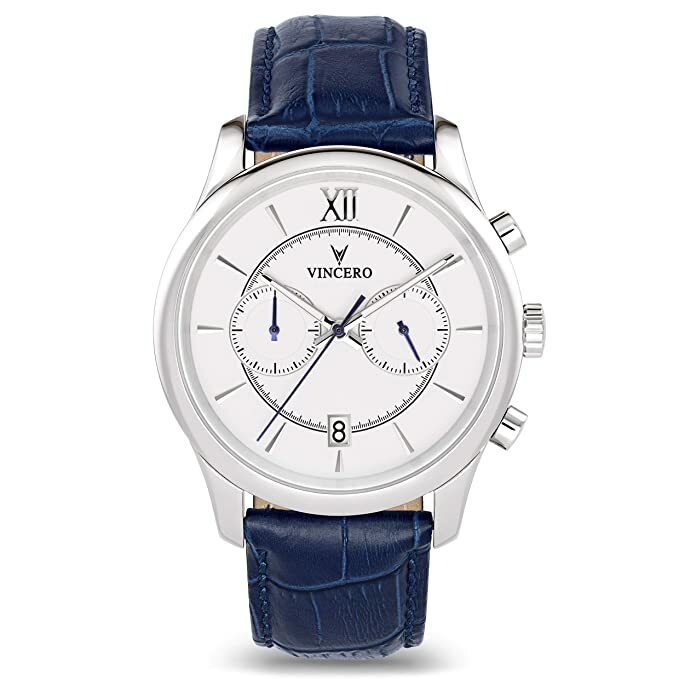 Even in my “Watch Enthusiast Circle” (which is just a few guys really), Vincero was quite a late and recent discovery. 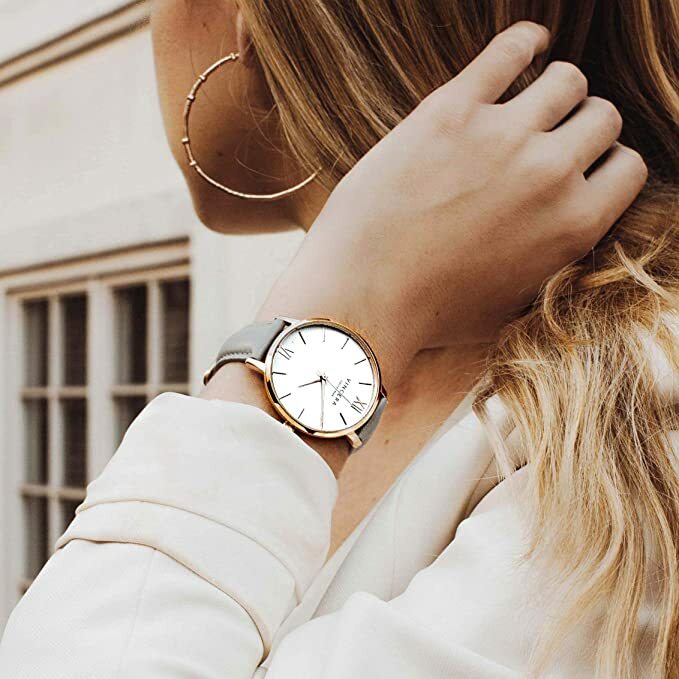 Since their inception in 2014, they have steadily grown to be quite a reliable watch brand, which majorly appeals to shoppers who place equal emphasis on style and affordability. When it comes to cost-effectiveness, the watch market is a very hard sphere to crack. Pairing affordability with an elegant and detailed design is not something that all watchmakers are able to achieve. But Vincero does just that with their models and sometimes even more. 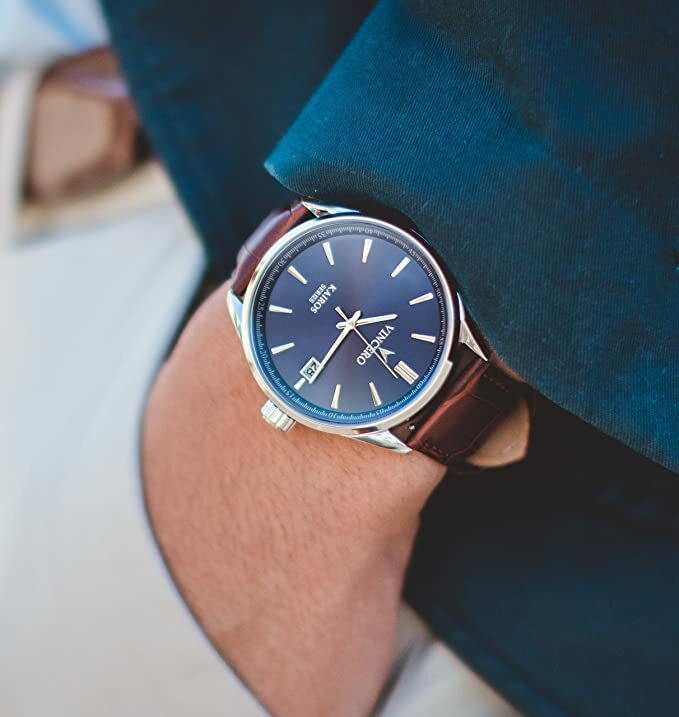 So if you are in need of an amazing timepiece that does more than sitting on your wrists like a stylish dress watch, then the Vincero watches are sure to be exactly what you need. What are the similarities between the two series? What can Vincero look to improve on in their line-up? Vincero was formed in 2014 by three longtime friends Tim, Aaron, and Sean. And as fate would have it, all three of them were colleagues in a production studio that designed and made traditional products for retail stores. But by 2013 they soon realized that the modern marketing trends favored cost-cutting more than quality, and mass production became the primary goal over independent and inspirational designs. And so they decided that they wanted to change the trend by forming a watch brand that celebrates both design and affordability. 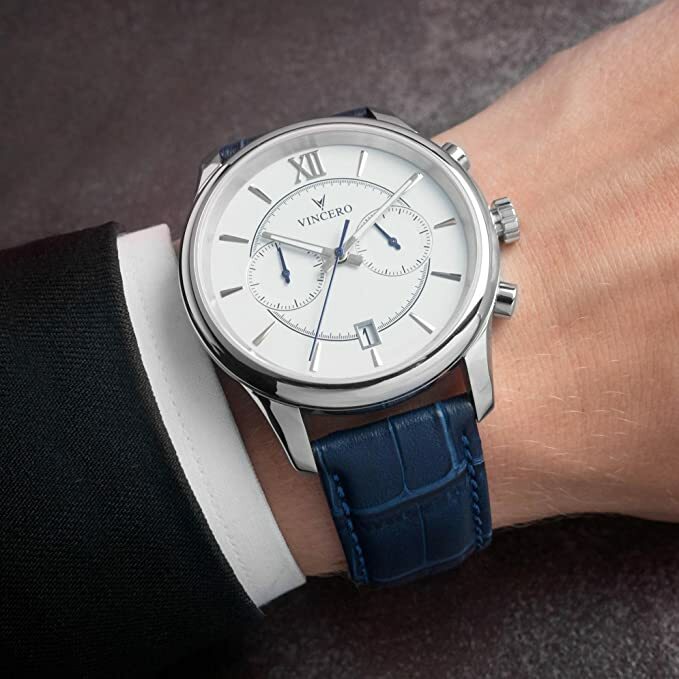 An elegantly designed classic timepiece need not be expensive neither does it have to lack durability. Making premium grade timepieces within the reach of all customers is one of their guiding principles. Going through their extensive catalog and recent sales report, I saw that out of all of their model variations, the Chrono S and the Kairos are the most popular and noteworthy. Both these series have a rather unique style to themselves that sets them apart from the rest of the Vincero models and the competition in the market. 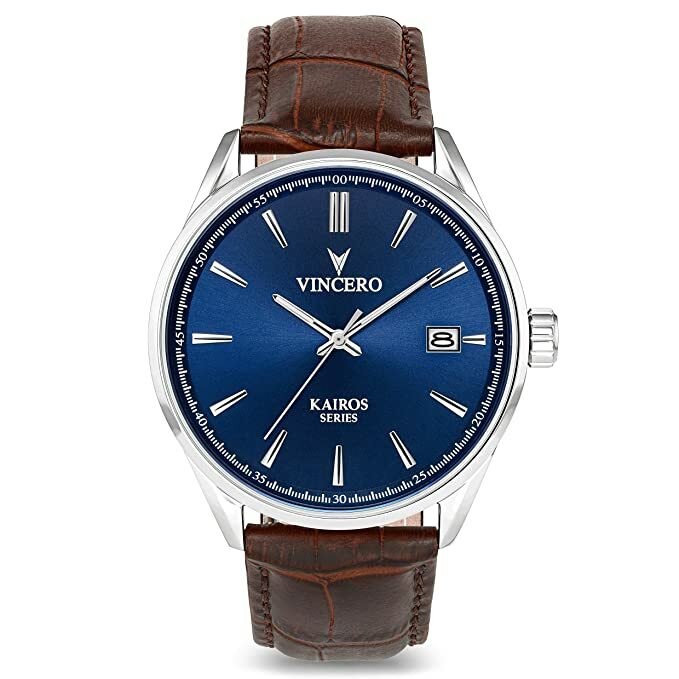 And when I first went into purchasing a Vincero, I bought a Kairos for myself and a Chrono S for my wife. As the same brand makes both these models, they have a lot of similarities in build and design, while still staying true to their uniqueness and series differences. Hence, I would like to begin talking about their differences and then move on to the build similarities. 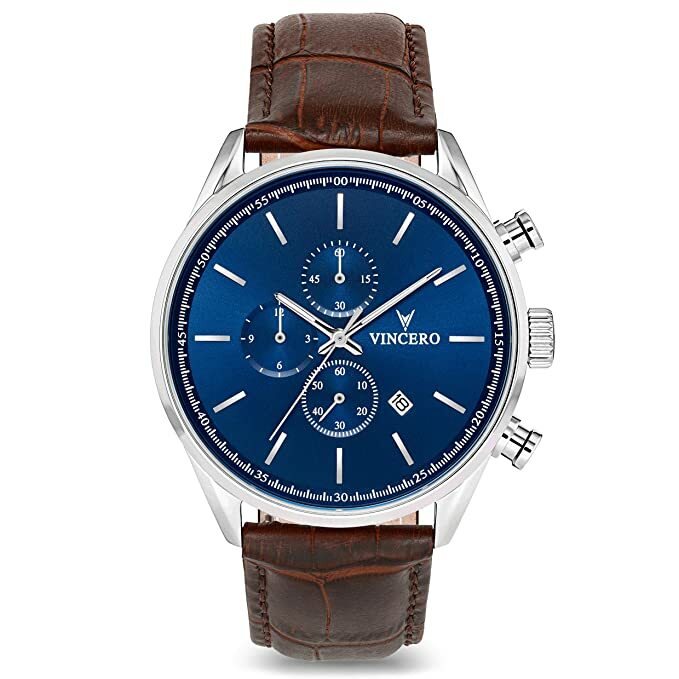 My wife absolutely adores her Chrono S; she said that “it looks casual but has a surprisingly professional appeal to it.” And when I see her wearing it every day at home and in her office, I realized just how apt that statement is. The Chrono S is all about superior quality and craftsmanship. When I placed it beside some of the watches from my collection, the difference in design and quality was immediately apparent. Each and every part of the watch was made with the utmost care and attention. Attention to detail is one thing that is often overlooked in watches of that price range (especially when you consider mass-production and cheap labor). But the designs of the Chrono S models have been studied rather carefully, almost obsessively if one might add; and made with the sole intention of making a bold statement every time you put it on your wrists. Each of the Chrono S models is made with the highest quality of Italian marble and surgical grade stainless steel. And as this grants the watch a somewhat mellow aesthetic, its distinguished look and quality may not be all that obvious from afar, but only on a closer inspection alone. 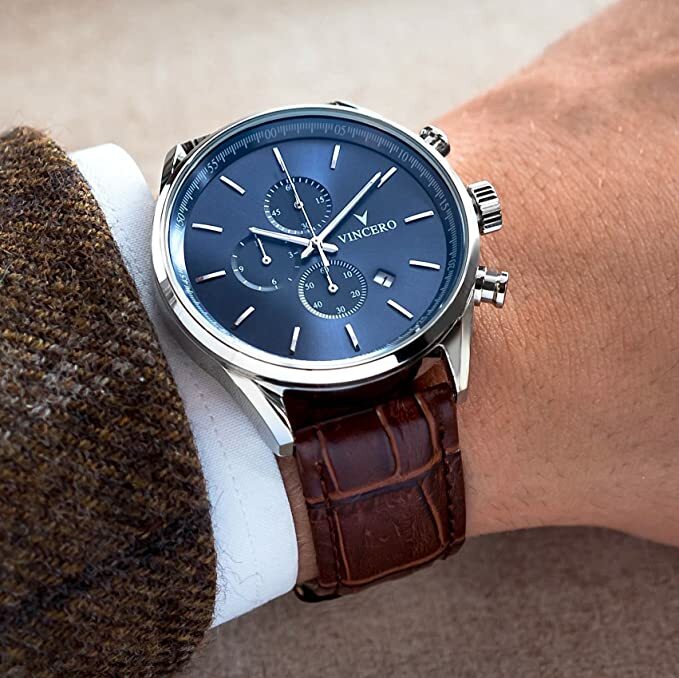 The Chrono S’ design along with the fantastic quartz movement makes the series absolutely perfect for both dress up and dress down occasions. For me, the most noteworthy and identifiable trait of the Kairos Collection is that their entire line-up uniquely consists of 6 combinations of watch cases, dials and color variations. The cases given to this series are quite elegantly made. Constructed out of stainless steel, the Kairos cases have a crown fashionably put at the 3 o’clock mark. And along with being 42 mm wide, it comes with a fantastic water resistance of up to 10 ATMs (which is quite huge if you ask me). Extreme water sports with this watch equipped will not be an issue. The sapphire coating on the watch is what helps grant it a lot of its durability. It protects the mineral crystal from damage along with giving the watch a very attractive look. There is also an engraving at the back of the case, with one of Julius Caesar’s most famous quotes, “Veni. Vidi. Vici” which translates into “I came. I saw. I conquered”. Though I am not exactly sure what the quote has to do with the watch or the brand, for “Kairos” was a Greek god, who was given the attribute of “time” along with “Chronus”. But it was not the stunningly simple and effective build of the case that attracted me the most towards the series, nor was it the engraving. What truly caught my fancy was the marble that is placed right at the center of the case. Vincero has stated that this Italian marble is a signatory piece that says “Build Your Own Legacy.” In a very “carpe diem” way, it reminds or rather encourages each wearer to seize every opportunity and form their own legacy just like how Vincero is striving to achieve. As they are created by the same brand, both the Chrono S and the Kairos have similarities in some of the base parts like the dial, the band, and the movements. Both the collections are given extremely beautiful dials which have a steep angle to the outer chapter ring, making the minute markers look scrunched, thereby adding a unique dimension to the look. The hour’s, minute’s and second’s hands are delicately designed, with luminous properties that glow in the dark and allow one to tell the time whenever required. Another unique aspect of the dial is that it allows each customer to color code it according to their preferences. It comes in 3 primary colors of a vibrant blue sunburst, jet black, and a pure white finish. The jet black I must add is my personal favorite. Every model of the Vincero, even the ones that don’t fall under the Chrono S or Kairos collection, is provided with a “black crocodile-patterned Italian leather band”. It is hand stitched together and has a contrasting tan on its underbelly. 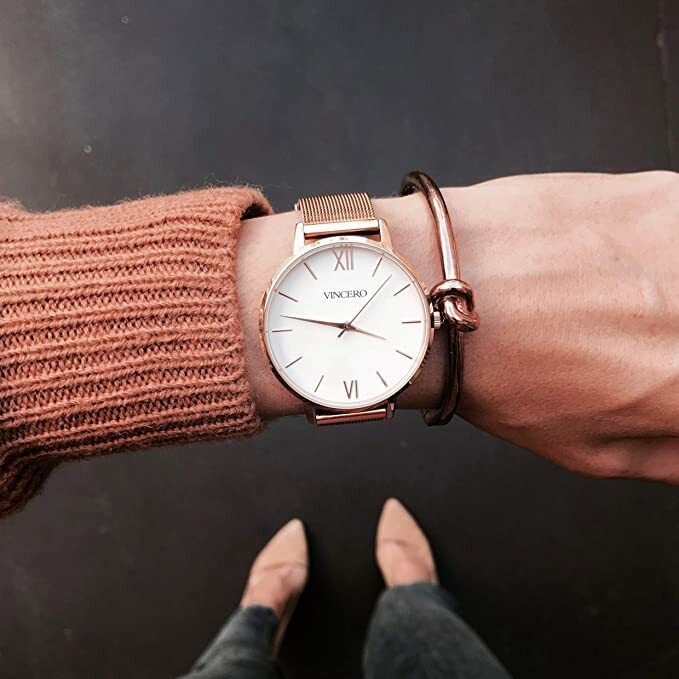 But even with the amazing quality and detail in design, the band is just 22 millimeters in width and not all that long in its length. And when I went through some of their reviews online, a lot of the customers have complained that the band is too short for larger wrists, and they had to get a cheap replacement form the local store. Vincero chooses a unique movement mechanism which is the Miyota quartz movement for their watch line-up. This line of movement mechanism is quite a favorable choice for a watch company that stresses both affordability and build quality, as the Miyota quartz is all about offering the best at a very reasonable price. The Miyota quartz movements are kind of like a middle ground between the standard Quartz movement and the Swiss ETA movements. It is almost 3 times cheaper than the Swiss ETA and has been proven beforehand to be almost as reliable as the Swiss ETA. Apart from the single band length, which can be quite short for larger wrists, the Vincero line feels somewhat underwhelming when it comes to their watch design variations and style. Apart from the Chrono S collection and the Kairos collection, none of the other watch models or builds standout all that much. They don’t have much of an appealing design nor do I see that much stress or attention has been given to their detailing. And even with the Chrono S and Kairos, the watches in each collection don’t look all that different from the ones in their respective series. Another issue I had with the brand was with their dials and the luminous hands. Yes! Even though the hands glow in the dark and help with checking the time at night, the numerals are not provided with a luminous coating; hence we can only guess as to what the hands are pointing at. 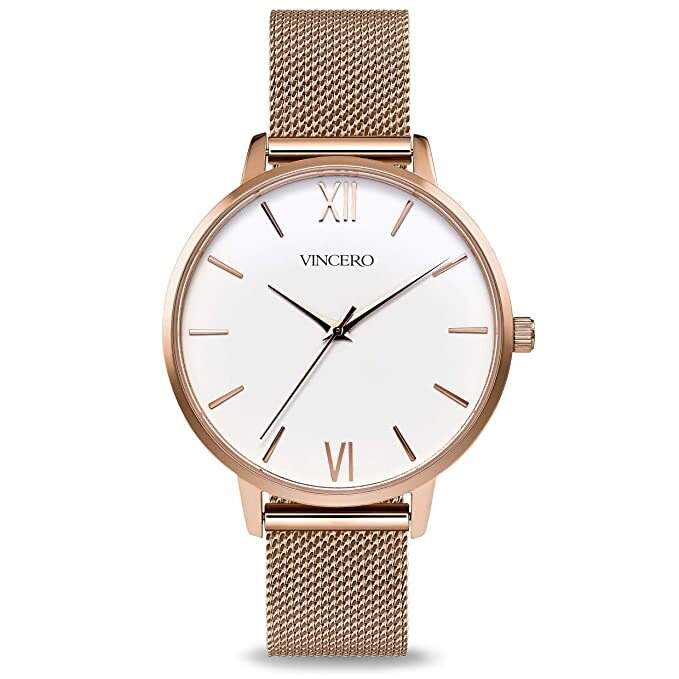 The Vincero Watches are an amazing upcoming brand that has steadily grown in popularity over the years. And I believe that in the next few years there will be quite a stiff competition for leading brands like Glycine, Coifman, and TechnoMarine. Hope you enjoyed my Vincero watches review today and can now make an informed decision.